Crvena Zvezda Telekom Belgrade gave its fans a shot at a packed Hala Pionir before defeating FC Bayern Munich 85-76 to capture third place in Group A and with it a spot in the Top 16. Zvezda finished the regular season with a 5-5 record; the loss knocked Bayern to fifth place and it will continue its European campaign in the Eurocup. 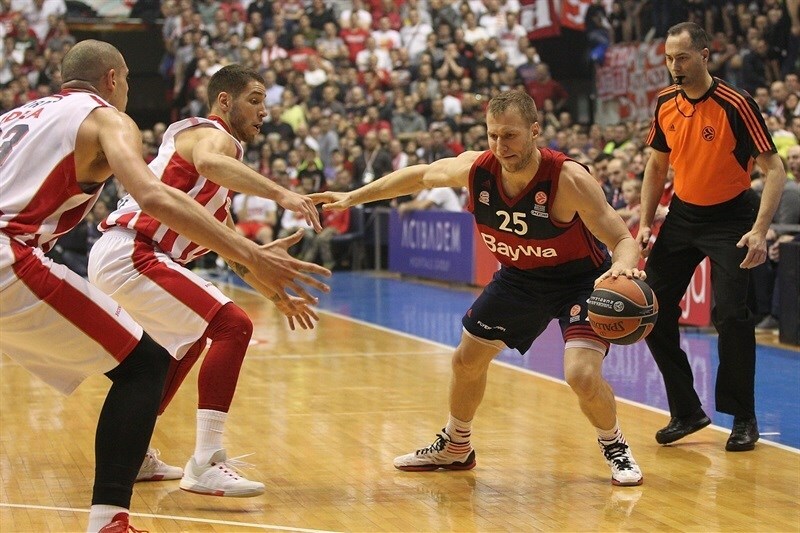 Zvezda took charge early and led by as many as 13 in the first quarter, but Bayern slowly came back. A 2-12 third-quarter run put the visitors in the driver’s seat and they led by as many as 11. 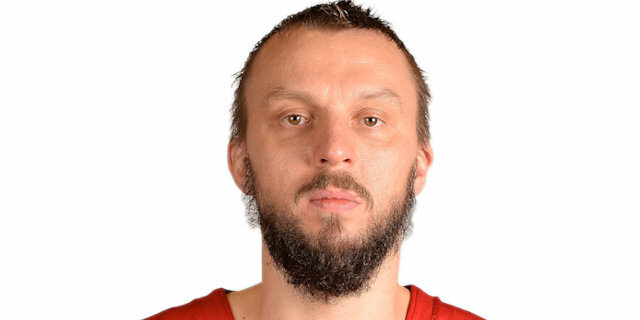 But the fourth quarter belonged to Zvezda, which rallied behind great shooting from Marko Guduric and big plays from Stefan Jovic, Maik Zirbes and Quincy Miller to win big. Miller paced the attack with 21 points and 10 rebounds, Zirbes added 17 points and 9 rebounds, Guduric scored a career-high 16 points and Jovic tallied 9 points and 13 assists. 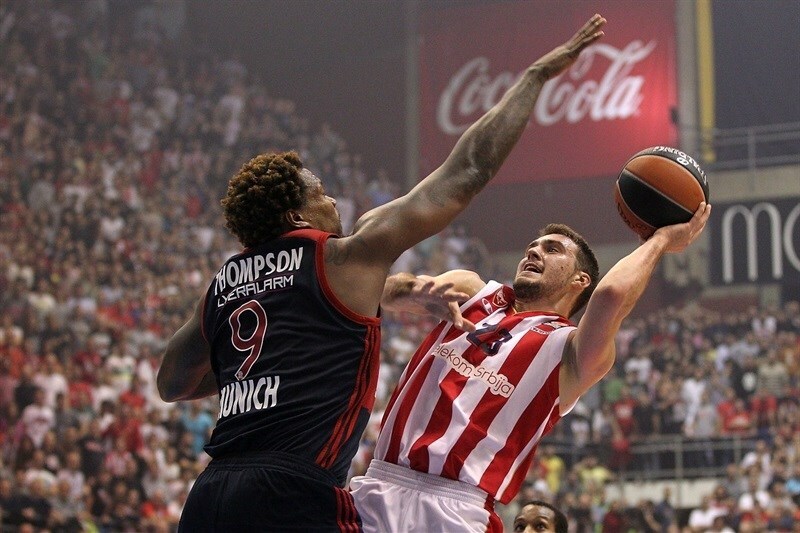 Dusko Savanovic paced Bayern with 19 points, Deon Thompson tallied 17 and K.C. Rivers 10. Deon Thompson’s turnaround opened the scoring before Branko Lazic’s free throws got the hosts going. Zirbes split free throws to give Zvezda its first lead and then took a pass from Jovic for an alley-oop. Savanovic tied it at 5-5 with a three from the corner. 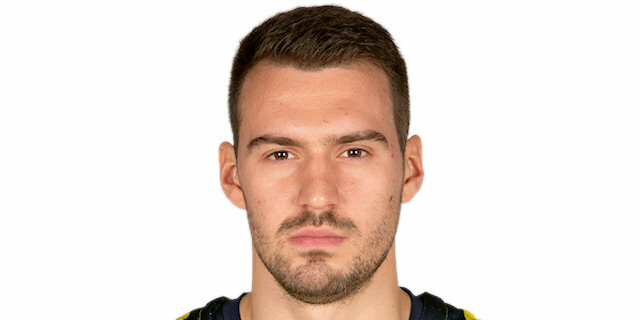 Lazic drove for a layup and after Miller blocked a shot, Marko Simonovic and Miller hit back-to-back threes and Bayern called timeout at 13-5. Jovic completed an 11-0 run with a layup-plus-foul. John Bryant stepped out for a three-pointer to end the Bayern drought, but Simonovic countered with his second three. Savanovic tried to revive the visitors, but Miller drilled a triple and then split free throws to extend the lead to 13. Savanovic connected again from downtown and after a pair of Zirbes free throws, Savanovic netted his third triple. Nihad Djedovic drove for a tough layup to make it 25-18. Zirbes scored twice thanks to Jovic on the pick-and-roll and Miller on the break. Paul Zipser’s block of Miller triggered a fast break that ended in a Djedovic layup. Vladimir Stimac free throws made it 31-20 after 10 minutes. Alex Renfroe hit a jumper and sent a great pass to Zipser for a layup to bring Bayern within 7. 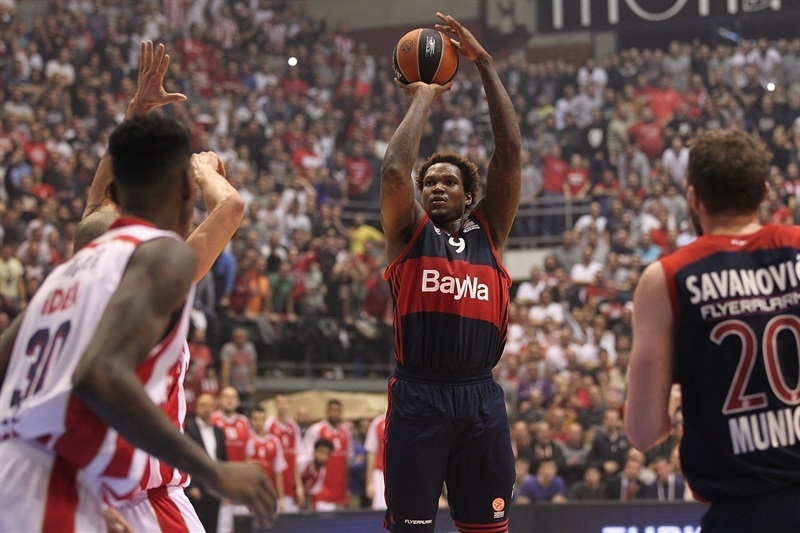 Deon Thompson’s second-chance score drew Bayern within 5 and resulted in a Zvezda timeout. Jovic came back after a rest and Miller ended the hosts’ nearly-four-minute long scoring drought with a pull-up jumper. Deon Thompson connected with a jumper to make it 33-28 midway through the quarter. Guduric hit a long triple to beat the shot clock, but Taylor hit a jumper and K.C. Rivers nailed a three to bring the visitors within 3, after which the hosts used another timeout. 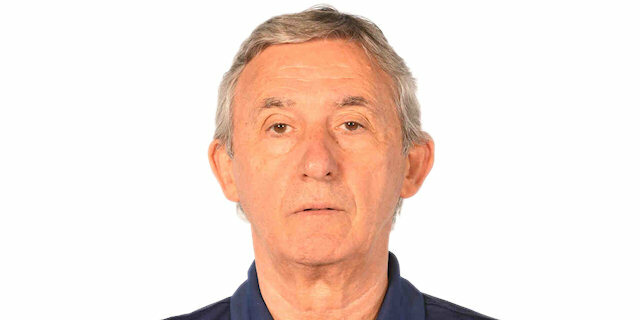 After a Guduric jumper, Savanovic scored a tip-in. 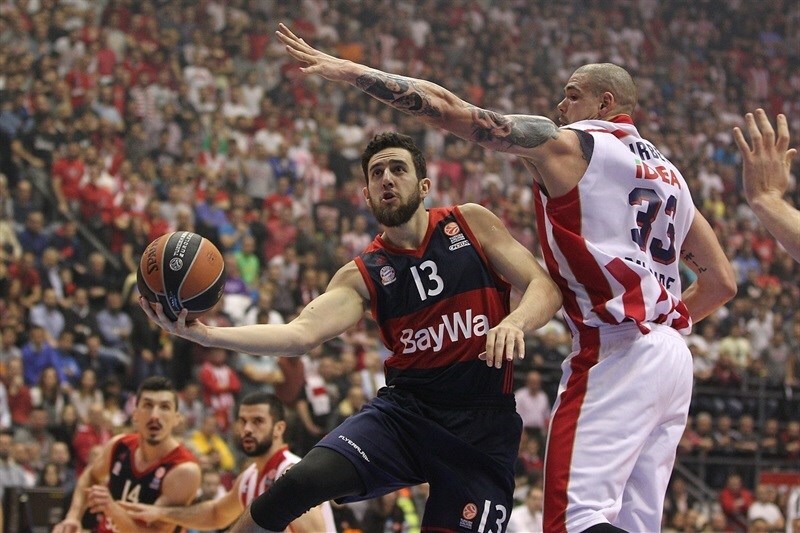 Zirbes found Miller for a layup, but after a Bayern timeout, Savanovic scored again. Guduric drove for a slam, but Deon Thompson did even better with a slam plus foul to make it a 2-point game. Miller’s tough layup made it 44-40 at the break. Simonovic opened the half with a long jumper, but Renfroe countered with a three from the top of the key. After nearly two minutes without scoring, Djedovic turned a steal into a layup and foul to tie the game at 46-46. Renfroe drove for a layup that gave Bayern its first lead since the first minute. Zvezda used a timeout, after which Lazic tied it with a long jumper. Savanovic banked in a shot, Djedovic split free throws and Deon Thompson dunked as Bayern took a 48-53 advantage. Ryan Thompson rose for a slam and Zirbes sank free throws. Blocks by Ryan Thompson and Miller forced Bayern into a 24-second violation. Taylor sank free throws to keep Bayern ahead. Anton Gavel sank free throws and seconds later stripped Jovic for a layup and a 52-59 lead. Ryan Thompson scored on the offensive glass, but back-to-back threes by Rivers capped a 2-12 run that put the visitors up 11. Jovic found Stimac for a layup and the latter rejected Gavel to end the quarter with Bayern ahead 56-65. Zipser fed Savanovic for a layup, but Zirbes answered for Zvezda. 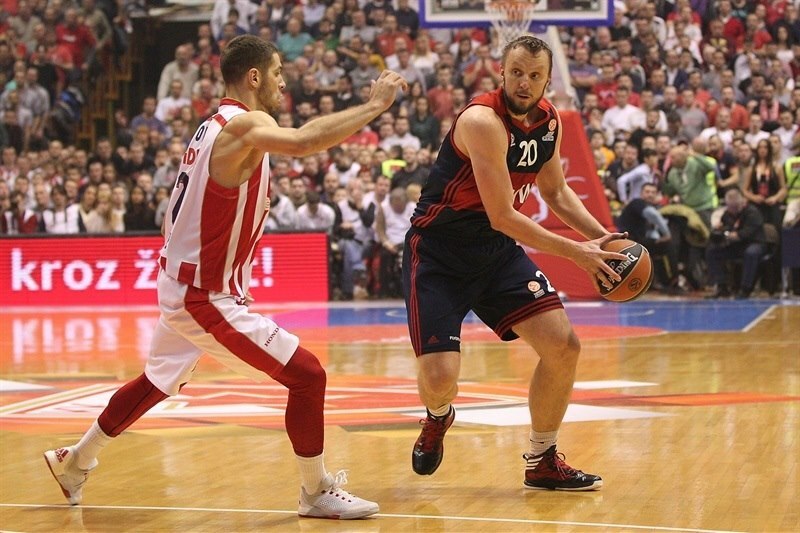 Jovic hit a deep three and Gururic followed with a three-plus-foul as the arena erupted and Zvezda came within 65-67. Reivers fed Deon Thompson for a slam, but Guduric made it a 1-point game with another deep three. Miller muscled his way to a basket that gave his tea, a 70-69 lead. Deon Thompson answered for Bayern and Renfroe scored on the break to make it 70-73 with five minutes to go. 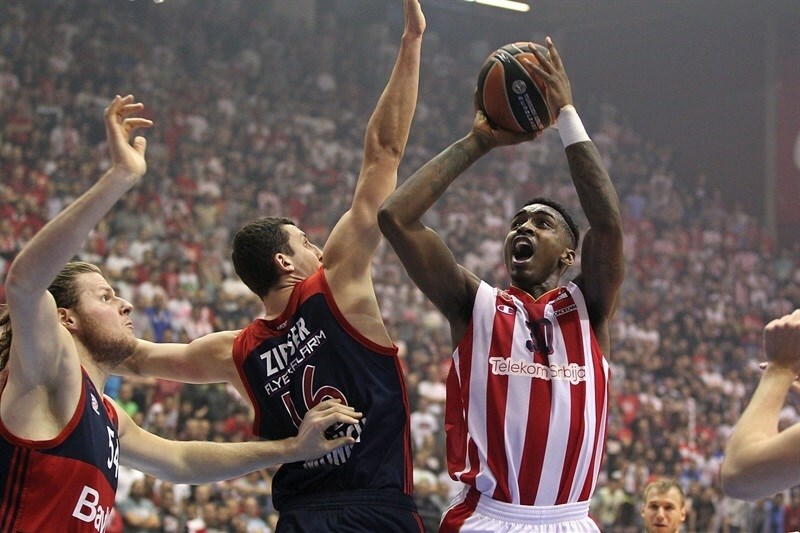 Guduric hit free throws and Miller dunked on the break as Zvezda climbed in front. Jovic found Zirbes for an easy score and a 3-point lead with three minutes to go. Lazic was called for an unsportsmanlike foul after a steal by Rivers with 2:17 to go. Rivers split the free throws, but Jovic forced a turnover from Gavel. Zirbes’s free throws with 90 seconds to go made it 78-74. Miller’s triple with 48 seconds to go all but sealed the win. When Rivers missed a three and Jovic made one, the celebrations began. 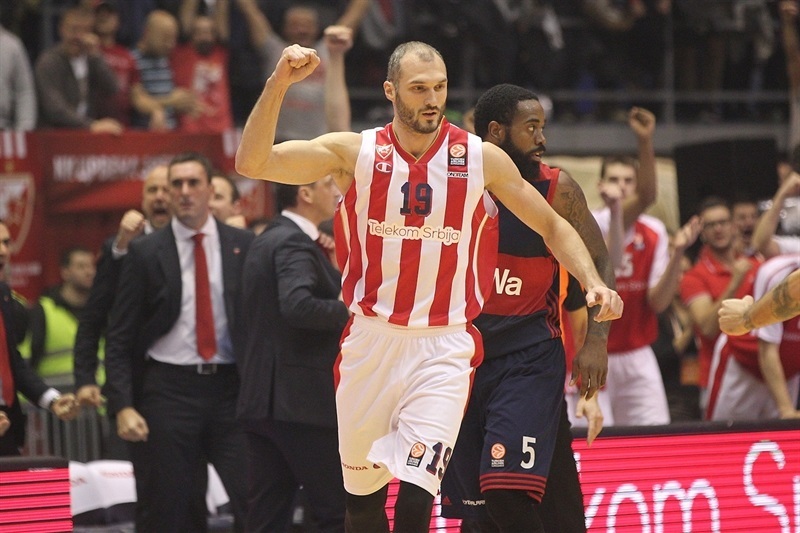 "Crvena Zvezda deserved that win. We played very good defense, but the hosts managed to score from some tough shots. We gave our best, but Guduric scored two fantastic triples. We were 11 points ahead and if a team beat us, that team deserves congratulations. I am not feeling like a loser. 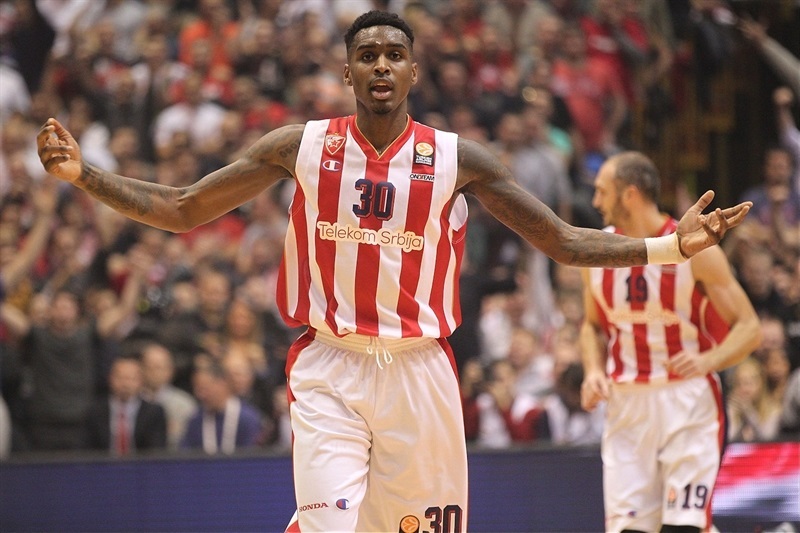 That win means a lot to Crvena Zvezda, much more than to any another team in the Turkish Airlines Euroleague. Why? I don’t know. We missed Bryant who is our best rebounder. He disappointed tonight. And we missed a little bit of athleticism and strength. That is the reason the hosts had so many second chances." "We are very happy. I’m so proud of my teammates, this city, this club, these fans. Thanks to everybody. We needed this support. I hope we’ll continue like this and win as much as we can in the Top 16. We made it. That’s the most important thing. Let’s celebrate!" "We played good and we did our best but it was not good enough. We opened the game badly, but later we managed to lead. I think we were not lucky tonight. I am sorry, but we did our best ,really."